The 1920 Decatur Staley team photo. According to the Kingwood College Library website, it took 13 days to cross the United States from New York to California in 1920. That year, a man named George Stanley Halas was helping lessen the length of that trip by working as a bridge engineer for the Chicago, Burlington and Quincy Railroad. Not that Halas had had a dull life up to that point. By 1920, he had already played college football at Illinois, participated in the military during World War I and played professional baseball for the New York Yankees. In 1919, however, Halas had decided to settle down, move closer to his family in Chicago, and concentrate on earning a decent living in a "real" job. Until one day in March 1920, when his phone rang unexpectedly. On the other end of that phone call was George Chamberlain of the A.E. Staley Company from Decatur, IL, which is around 200 miles southwest of Chicago. The company had fielded a club football team the previous season, and Chamberlain wondered if Halas would be interested in taking a job with his company. Halas would be a starch-maker by day, and on the side would re-organize the football team, as well as found baseball and basketball teams. Chamberlain learned of Halas due to his college football days, as well as his achievements in coaching and playing for his Great Lakes Naval team during The Great War. Halas jumped at the opportunity and relocated to the Central Illinois town. Halas traveled the midwest that summer, in what he called the "first professional football recruiting trip", signing the 1920 Staley team. Included in that charter roster of players were Dutch Sternaman, Hugh Blacklock, George Trafton and Guy Chamberlain. Halas scheduled games against other club teams from Illinois that fall, and in September traveled to Canton, OH, for a legendary meeting with other professional team owners. From that informal meeting came the American Professional Football Association, which would be renamed the National Football League several years later. Each organization scrounged and came up with $100 each to join. Imagine the capital gains taxes the McCaskey family will pay when they sell the Bears for close to $1 billion! The Decatur Staley football club played 13 games in 1920, finishing 10-1-2. No champion of the loosely organized 1920 AFPA was named. Prior to the 1921 season, A.E. Staley himself called Halas to his office. Business was down and he could no longer afford to subsidize the team. He gave Halas his blessing, and encouragement, to move the operation to Chicago, a much larger city. 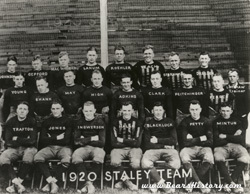 Staley provided Halas the team's uniforms, seed money, and asked that he keep the Staley name for the 1921 season. Halas also agreed to provide free advertising in game programs for the Staley Company. Halas and Sternaman, partners in the new venture, secured an agreement with Bill Veeck, owner of the Chicago Cubs, to play in Cubs Park. The two parties agreed on a mutually beneficial lease, with the Cub owners drawing a percentage off of Bears ticket sales, and the Chicago Staleys were in business for 1921. The same lease terms would remain in effect until the Bears moved to a larger venue, Soldier Field, in 1971. Wrigley Field to this day remains the site of more professional football games than any other stadium. In 1921, the Green Bay Packers joined the AFPA, while the Chicago Staleys finished with a record of 9-1-1 and were named league champions for the first time. In 1922 they decided to change the name of the team, and first considered the Cubs in gratitude to the benevolent Veeck. But Halas, surmising that football players were generally bigger than their baseball counterparts, decided to name them the Bears. That year Halas also acquired Hall of Fame tackle Ed Healy from the Rock Island Independents. The 1923-1924 seasons were largely a battle to draw spectators to the new game of professional football. Many purists of the sport looked at it as tarnishing the the reputation and ideals of the collegiate sport, where the game was played for the thrill of battle rather than for money. Soon the two competing ideologies would begin to meld. Harold "Red" Grange, from Wheaton, IL, was a football phenom at the University of Illinois in the early part of the decade. An enterprising owner of a moviehouse in Champaign, IL named C.C. Pyle met with the "Wheaton Iceman" during the fall of 1925 and proposed he join the ranks of the professional. Shortly after this meeting, Pyle began negotiating with Halas and Sternaman, proposing a coast-to-coast football tour that would pit the Bears against any local team willing to play. The Bears signed Grange under the noses of other professional teams, and Grange joined Chicago for their final two games of the '25 season. After the 1925 regular season was complete, the Bears embarked on the historic "Barnstorming Tour", which took them across the country from the Northeast, to Florida, then to the Pacific Northwest. The Bears played 16 games in 45 days, bringing the sport of professional football to hundreds of thousands of new fans. Grange and his agent made over $100,000 from the tour, but at its conclusion asked for an ownership stake in the team for him to continue with the Bears in 1926. Halas and Sternaman refused, and Grange was done as a Bear, for the time being. From 1926-1928 the NFL fought a successful battle against a rival league founded by Pyle, and in 1929 Grange re-signed with Chicago. Halas and Sternaman retired from coaching to focus on running the business end of the club, and hired a new head coach, Ralph Jones. After helping give birth to a new league and American pastime, the Bears would soon innovate a new style of play, as they continued to do so many other times in their history. At the recommendation of A.E. Staley, George Halas and Dutch Sternaman moved their football team to Chicago in 1921. Known as the Decatur Staleys in 1920, they were the Chicago Staleys in '21 and took the name Chicago Bears in 1922. Chicago Cubs owner Bill Veeck was helpful to Halas and Sternaman, allowing them to play at Cubs Park (later Wrigley Field) for a fair price. To show their gratitude, Halas and Sternaman considered naming their team Cubs, but decided they should be the Bears since football players are larger than baseball players. Halas chose the colors Blue and Orange in deference to his alma mater, the University of Illinois. Halas and Sternaman brought the new game of professional football to the masses in 1925, when they organized a "Barnstorming Tour" around the country, featuring their newest star Harold "Red" Grange. Grange, a Wheaton, IL native, became known as the "Galloping Ghost", but was known as the "Wheaton Iceman" before this.